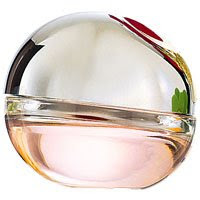 DKNY Be Delicious Fresh Blossom Eau de Parfum Spray is a radiant fragrance that marries freshness, vibrancy and feminity. A blend of sparkling grapefruit, casses and sun-kissed apricot meets a blooming floral heart of sheer muguet and petally rose, wrapped in luminous jasmine. Finish the apple sensation with a body lingering base of blond woods and smooth skin accords. And coming soon from DKNY, Women Summer 2009 (shown above right), the yearly summer limited edition variation on 1999’s DKNY Women. This year’s notes: pink grapefruit, ginger, lychee, pink jasmine, peony, mango and lily.